The harebell (Campanula rotundifolia) is common throughout the UK, but north of the border it’s known as ‘the bluebell of Scotland’. Other folk names include ‘old man’s bell’, ‘cuckoo’s shoe’, or ‘witch bells’. The bell-shaped, scentless flowers can vary from pink to white, but most commonly they’re a wonderful sky blue. Their nodding heads appear on single stems or loose clusters from late spring through to September. 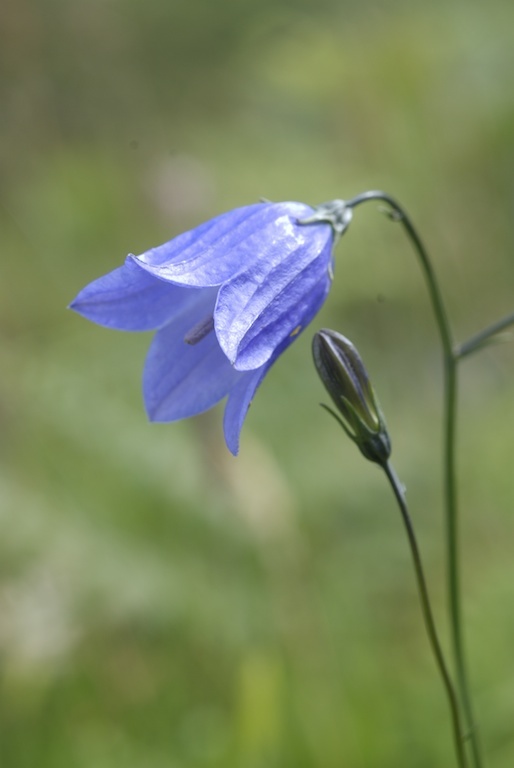 Despite its fragile appearance, the harebell is remarkably tough. It thrives on grassy, windswept hillsides, in dry stone walls and on cliffs. We’ve found harebells in a variety of habitats, from mountains and moorland right down to the carpet of machair that fringes many western beaches. These harebells (top) were seen in the Grampians, while the single flower was photographed near Ellenabeich on Seil Island. I had no idea that the harebell was so common throughout the UK! We’ve got these beautiful wildflowers located all throughout Colorado, and I’m sure into Wyoming, Utah, and the Northwestern States of the US. Thanks for sharing the great photo. I didn’t realise that the harebell was found in the US, either! So that’s something I’ve learned. I wonder if it’s exactly the same species? I’m not sure, but they look incredibly similar! Unfortunately I’m not at my home computer where I have a few pictures that I took, but after some research I found a great resource for wildflowers in the US. The United State Department of Agriculture has a database of plants, which includes the Campanula rotundifolia. The photo was taken right here at Rocky Mountain National Park in Colorado. We call them Bluebell Bellflowers, just another reason why scientific names are important. Small world, eh? Thank you – that’s very interesting! I can imagine the countryside covered in these beautiful flowers!!! They do make a beautiful sight – they don’t form ‘carpets’ like the better-known bluebells pictured in my Editor’s letter for March, but they still make a colourful addition to lots of hedgerows and scrubby grassland. Yes, they are beautiful! Take a look at this link, supplied by Aveena (see her comment above) – the harebell occurs in the US and apparently it’s the same species as ours. You might be lucky! The machair only had primroses, daisies and dandelions on the islands, mind you there were hundreds of primroses, we were just that little bit too early to see it in its full glory 🙂 These are very sweet little plants. I think any plant that likes damp conditions is going to thrive this spring, after the mild wet winter! Yes, harebells are lovely, and a very delicate shade of blue – but no scent, at least as far as I can tell. The machair will be beautiful a bit later on, around midsummer I guess. Ah yes, the midges! Although I have to say we always seem to be lucky – if there’s a sea breeze it usually blows them away.